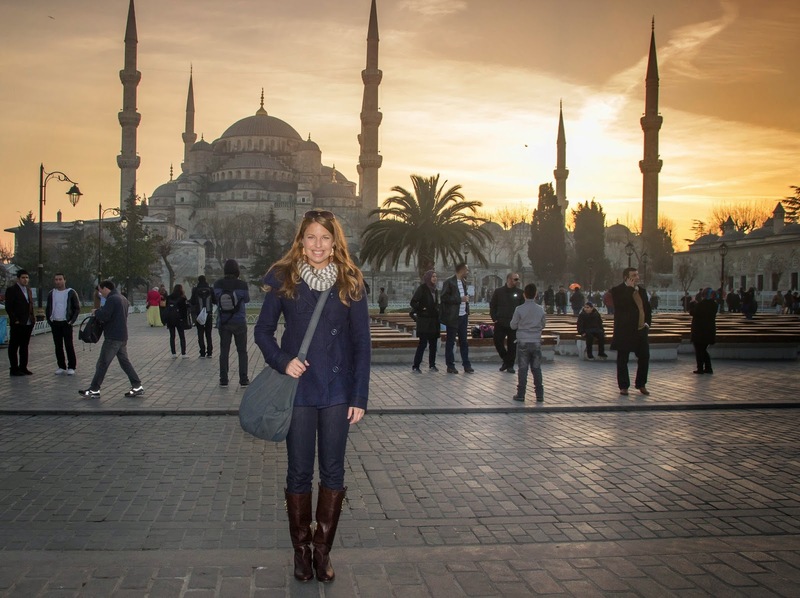 I couldn't have been more thrilled to visit Istanbul. Not a location I had planned to visit on this trip by any stretch, I had lucked into the opportunity when I found a flight to Portugal (my new "next destination" after my change of plans) on Turkish Airways, which had a layover in Istanbul. A little creativity on the Turkish Airways site and I had a multi-stop flight booked for even less than the "direct" route, and I had nearly a week to enjoy Istanbul. My flight wound up being delayed by about 5 hours due to fog in Istanbul (we actually landed at a nearby airport and waited for about 3 hours before attempting to land again), but I had thankfully pre-booked a stay at Nobel Hostel in the tourist district, and I easily caught a cab, arriving sometime around 3am, in the shadow of the enchantingly lit up Blue Mosque. I slept in the next morning, and the gracious hostel owners allowed me a late breakfast at their restaurant next door complete with cheese and olives, fruit, toast, hardboiled eggs, and coffee. I finally set out to explore in the early afternoon of my first full day, first stopping by the Blue Mosque, just around the corner from my hostel. The architecture blew me away, from the smooth stone of the exterior, to the massive, intricately decorated interior. I removed my shoes and covered my head in a scarf before stepping into the cavernous space - inside was a large open space, a square-shaped floor covered in soft carpet, with incredibly high ceilings in circular domes, all ornately decorated in geometric designs and Arabic calligraphy. Light fixtures of iron were suspended on chains from above, hanging relatively low (about 10 or 12 feet high) above our heads, compared to the height of the interior. Visitors were kept behind a barricade, while men entering to pray moved forward to kneel and pray in the larger central space. Women had a separate area in the back for prayer. 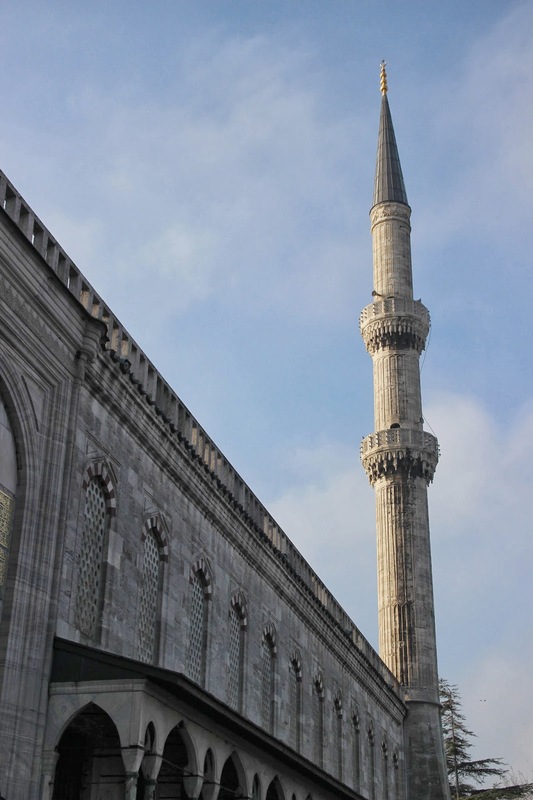 An interesting fact about the Blue Mosque: it's one of the only mosques in the world to have six minarets (and actually one of the only ones with more than four). This was a major point of contention when it was first built in the early 17th century, as only the Grand Mosque in Mecca had as many. As a result, an extra minaret was added to the Grand Mosque to 'settle' the dispute. Hungry for lunch, I wondered around the plaza between the Blue Mosque and the Haga Sofia, passing dozens of men hawking their restaurants, until I found a spot without anyone harassing me to come in. I tried some meatballs, pretty tasty, but not spectacular at this particular spot. 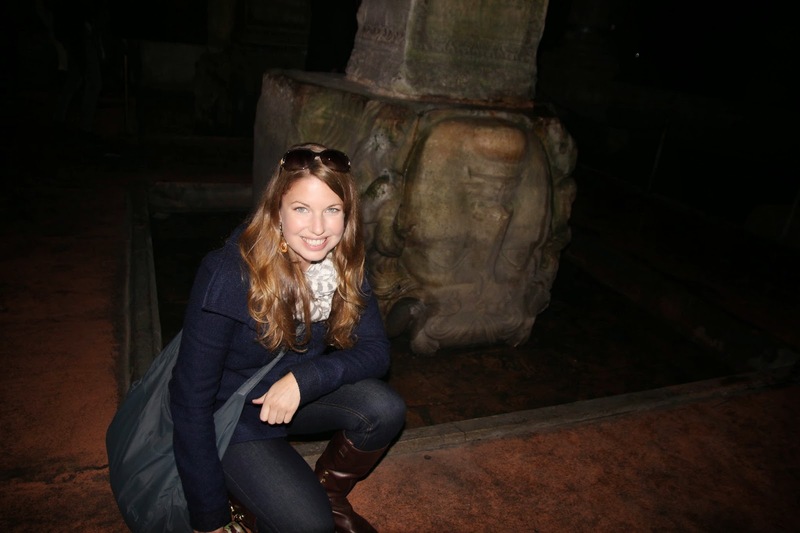 However, right as I exited, I noticed the entrance to the Basilica Cistern right next door, and I took the opportunity to pay it a visit. 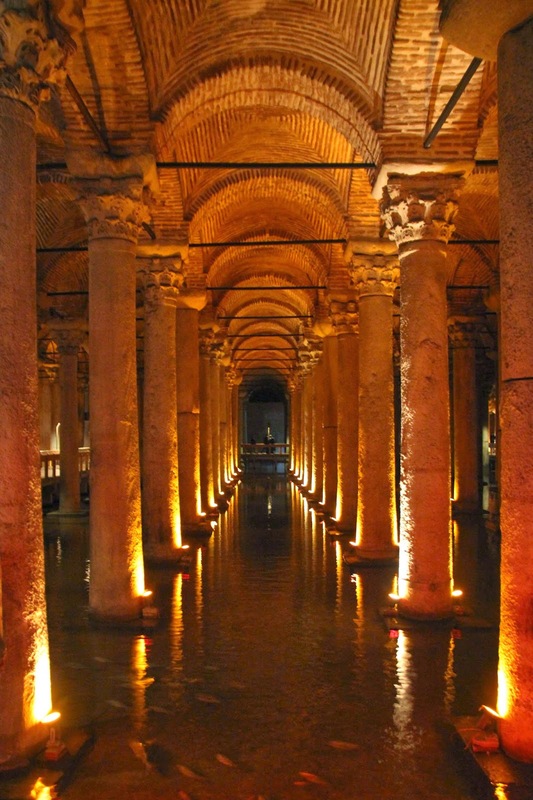 The inside was a dim expanse - moist air, arched ceilings supported by rows of columns resting in a few feet of water. A walkway guided us through the space, the columns lit in a soft orange glow. I snaked my way back, passing one out-of-place column covered in a circular pattern, finally arriving at two particular columns in the back corner. The water had been blocked off in that area to give tourists a glimpse at the unique bases - two heads of Medusa, likely plundered from a Roman building. One Medusa is fixed upside down, the other, on her side, perhaps to remove any 'power' that the sculptures may have possessed! After visiting the pair of Medusas, I continued along the walkway, past a group of columns with cone-shaped bases that widened at the bottom, until I reached the exit. That evening, I wandered along the metro path towards the Grand Bazaar, noticing a tiny old cemetery near the turn off for the bazaar, behind which was an expansive tea house, packed with locals just off from work. I finally found my way into the bazaar, which surprisingly felt much more like a sprawling shopping mall than the markets I was used to from my time in South America. 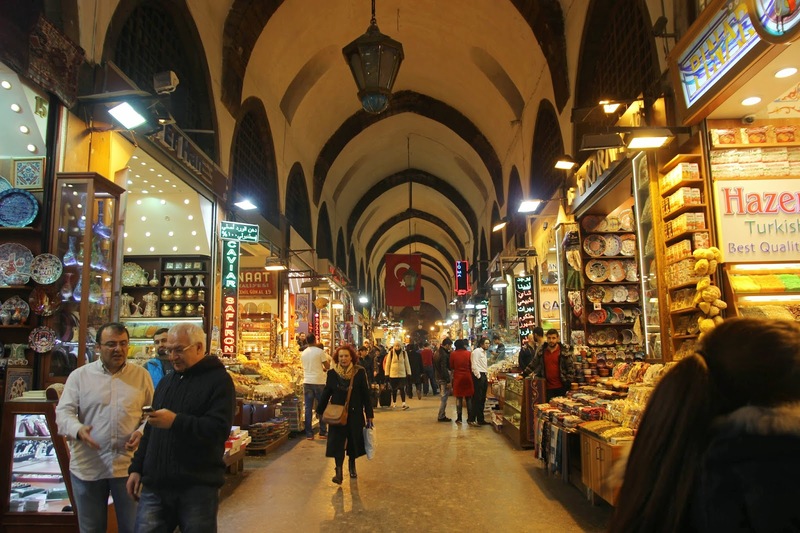 The bazaar is packed with fairly modern, lit-up little shops, nestled inside the ancient architecture - I had to remember to look up every once in a while to see the evidence of the ancient structure! I wound my way through the maze of leather goods, glittering jewelry, lanterns, artesanal items, and typical tourist souvenirs. It's easy to feel lost inside the winding corridors packed with people, so I was almost surprised to easily find the various exits and get my bearings. That evening I made my first of many visits to a tea house called Cafe Meşale near the hostel with my new friend Ana. 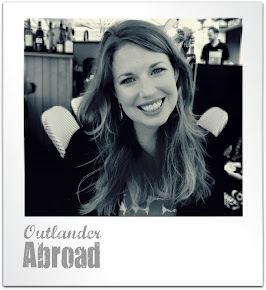 During my stay, we visited numerous times with whomever else we could convince to join us. While it was definitely played up for the tourist crowd, the atmosphere was warm, the waiters friendly, the food tasty, and the tea savory. 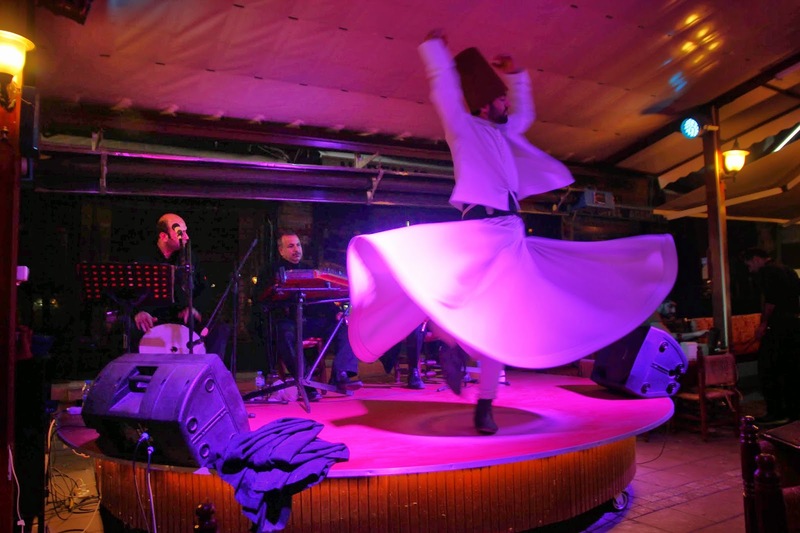 We were treated to a house band each night who played typical Turkish songs (always one at the end of the night that got the locals singing along), and they even had a whirling dervish on hand to give a performance a few times each night. Despite the performance essentially being in the middle of a bar, it still had a powerful, captivating magic to it. The dancer spun endlessly for many minutes to the rhythms of the music - beautiful and mesmerizing. During one of our visits, we shared a couch with some very put together Turkish ladies that we dubbed 'The Real Housewives of Istanbul' - they were amazing and kept us entertained all night, especially during that last call and response song performed by the band. On another occasion, Ana's mother and her mother's friend had visited, so we all shared a hookah and a giant platter of food for dinner. 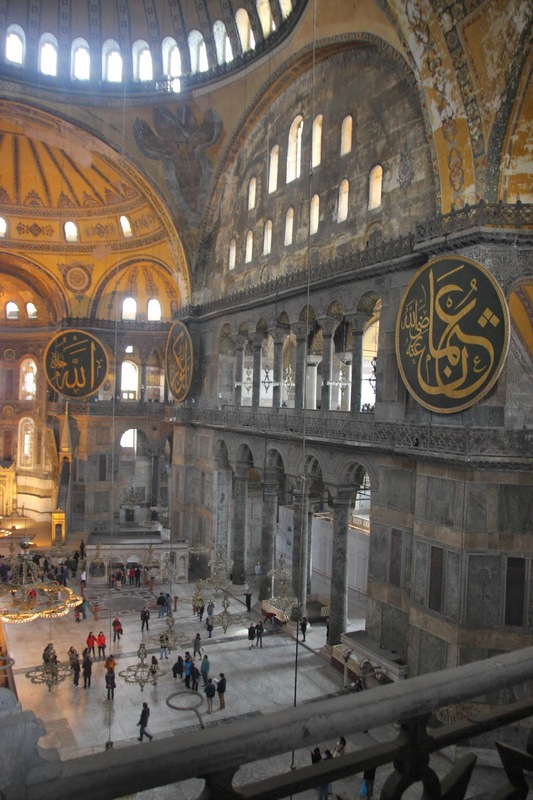 One of the biggest must-sees to any trip to Istanbul, the structure of the Hagia Sophia is nothing short of grand. 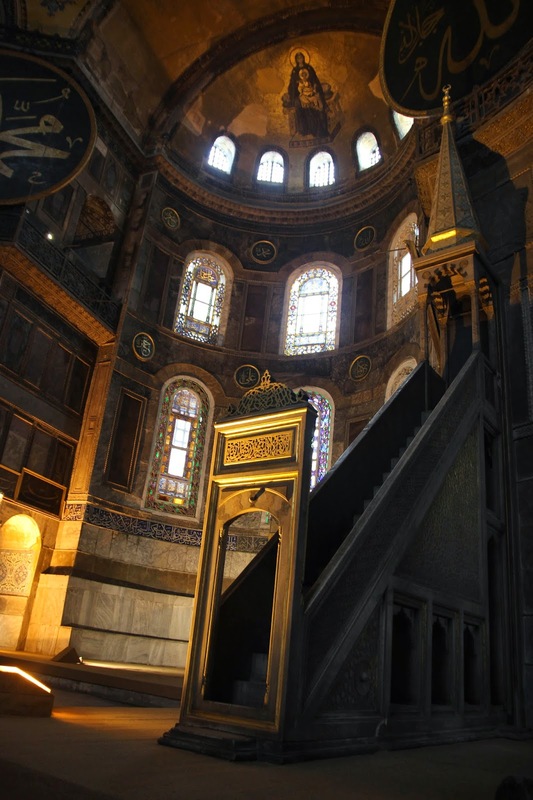 Originally built as a Byzantine cathedral in 537, it was converted to a Mosque in 1453, after Sultan Mehmed II and the Ottoman Turks conquered Constantinople. 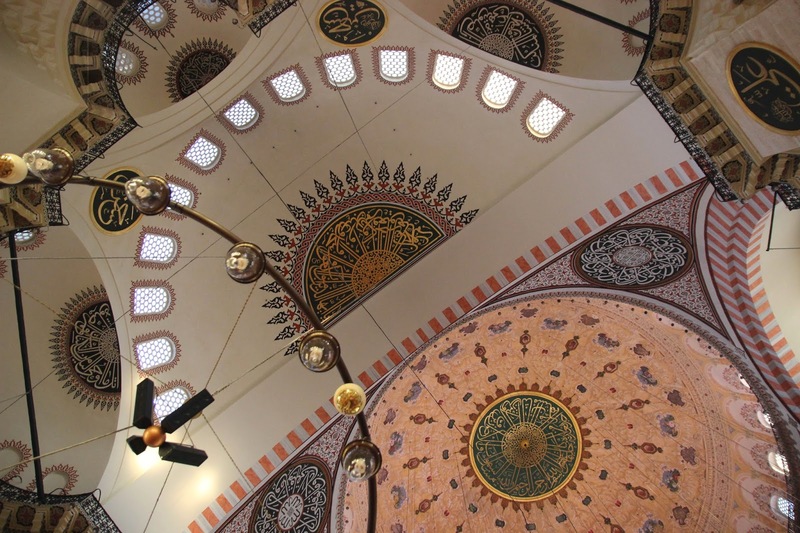 It remained a mosque until 1931, and it was re-opened in 1935 as a museum. Ana and I decided to visit early the next morning, entering through one of the main entrances, passing through two "spiritual moats" (as Dan Brown refers to them in his book, Inferno) - interior spaces walled off from the main religious area. 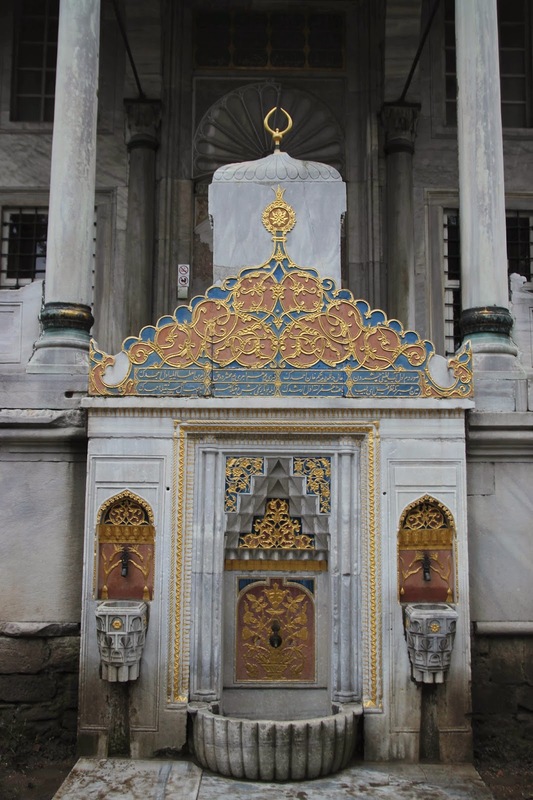 The first was very plain - basic stone - and the second was ornately decorated with mosaic tiles. Once inside, the enormity of the place was the most striking. The very top, while under restorative construction, was an enormous dome, flanked by images of four archangels. 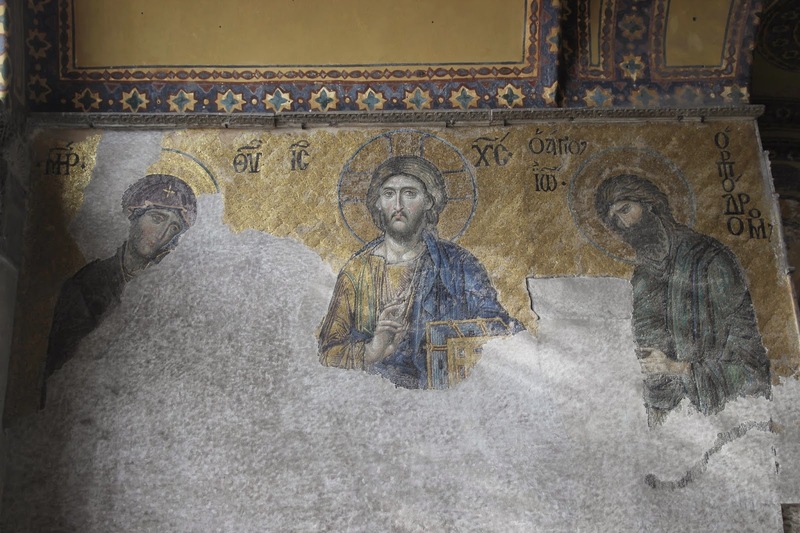 The front of the room displays a partially restored mosaic of Mary and the Christ child, set in between two massive discs of Islamic calligraphy. The Islamic midrib is located where an altar would have once stood, but is slightly off center, as it points directly towards Mecca - not exactly a consideration of the original cathedral construction! After exploring the ground floor, we made our way up to the second level - a balcony floor running all along the back and sides of the knave. The second level also acted as a gallery, full of restored murals, and provided an excellent view of the space below. 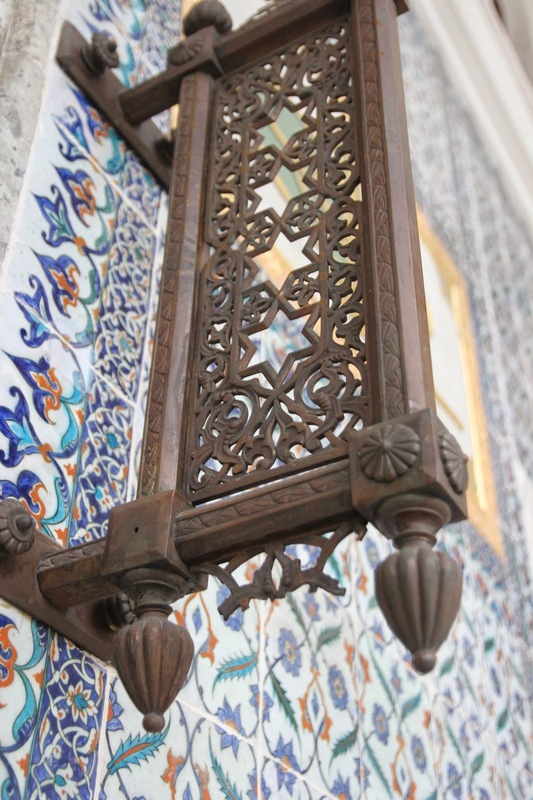 (When the cathedral was converted into a mosque, the Christian icons were covered in plaster, but thankfully many have been restored, and now sit alongside the Islamic script and decor, making the religious significance of the place that much more incredible.) On our way out, we stopped at a small column in the corner which is said to have the power to grant wishes - we followed the lead of those in front of us, placing our thumbs in the center and turning our hands all the way around the center to make our wishes! 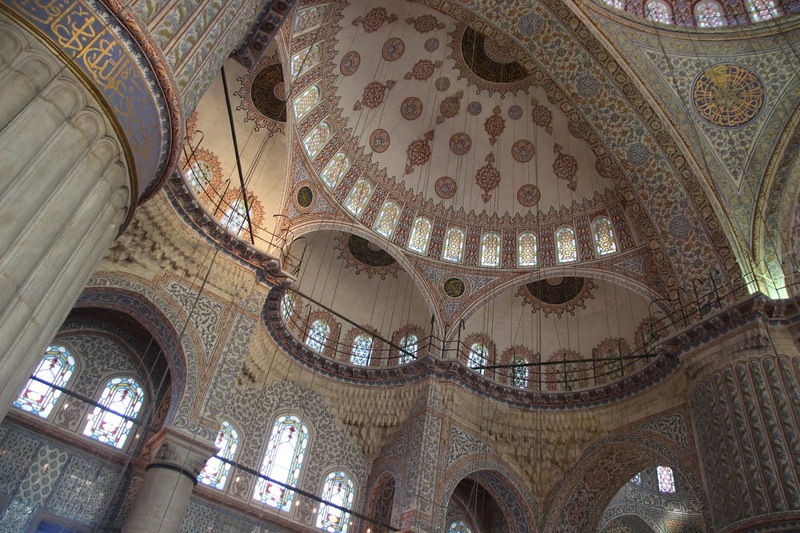 Once we had finally explored the entirety of the museum, we headed to the Blue Mosque for a quick visit. Along the way we stopped for a few baked goods from a street vendor and a cup of Turkish coffee. The coffee vendors were hilarious - giving us fake coffee readings (admitting they knew nothing about how to actually perform them) and generally entertaining us as we waited for prayer time to pass so we could visit the mosque. That evening, I set out with Ana and two other guys from our hostel, Edoardo and Iman, to visit the Spice Market, making a quick stop into the New Mosque en route. 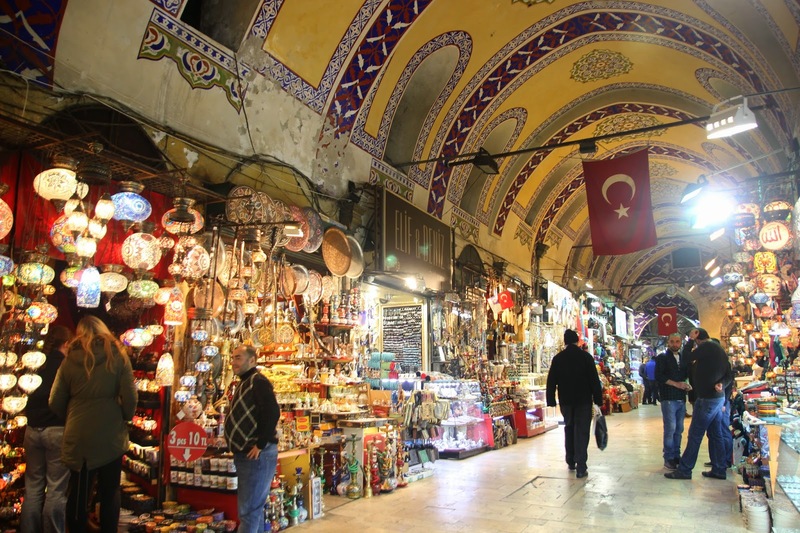 Venturing into the market, Edoardo took us by a few stalls (set up very similarly to the Grand Bazaar) in search of some specific teas and spices. As he browsed the samples, Ana and I were given samples of Turkish Delights - a gelatinous candy coated with pistachios or coconut or pomegranate, and also containing bits of pistachio inside the sweet middle. At a tea vendor (the Ottoman Spice Center in stall #17), we were given samples of a delicious flower-herb blend that had a very pleasant flavor - very floral and refreshing. While we didn't have long inside the market (it closed at 7), it was lovely to wander through the stalls, taking in the warm, sweet scents and gorgeous colors of the various teas and spices. On our walk back to the hostel, we passed an small art gallery and decided to peek inside. The artist was Melik Iskender, and he had a wonderful sampling of abstract takes on the whirling dervishes and various sites around Istanbul. We each bought a small piece (keeping to my theme of buying art everywhere I go), and he gave us each a small evil eye token as a gift. That evening, we made a return to our favorite tea house for music, dinner, and the whirling dervish performance. 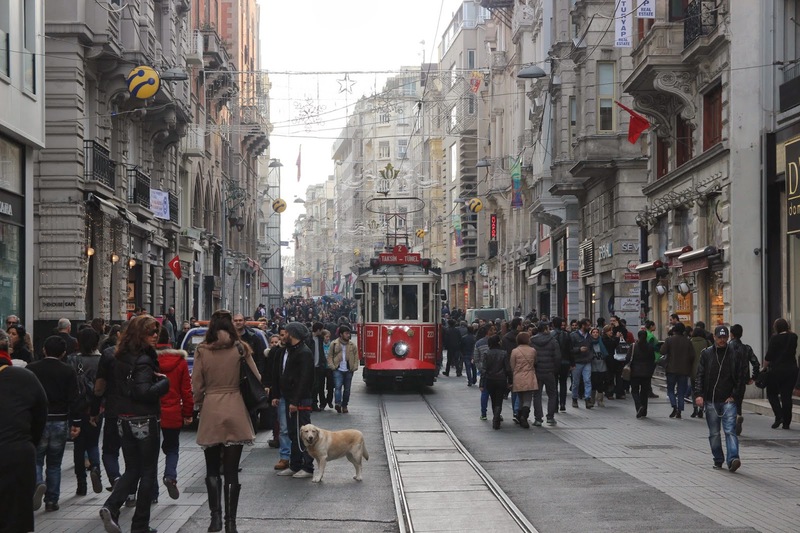 The following day I was lucky enough to be given a culinary tour of sorts by a local that a friend had put me in touch with, but I'll share a bit more of that in my next post, focused on the food of Istanbul :) However, during my time with him I also had the chance to wander down Istikal Caddesi, a major thoroughfare from Taksim Square to Galata Tower. Filled with locals, tourists, and dozens of shops and side alleyways, the street is a constant buzz of activity. One side street, dubbed "French Street", was colorful, packed with cafes and artsy shops. Another was called "Flower Street", more of an alleyway through and in between buildings, it was packed with restaurants with patios serving cold beer. Other alleyways had themes of their own - one was packed with cafes, another, full of fresh seafood offerings. Back on the main road, we stopped at St. Antonio Church, the largest church in Istanbul. 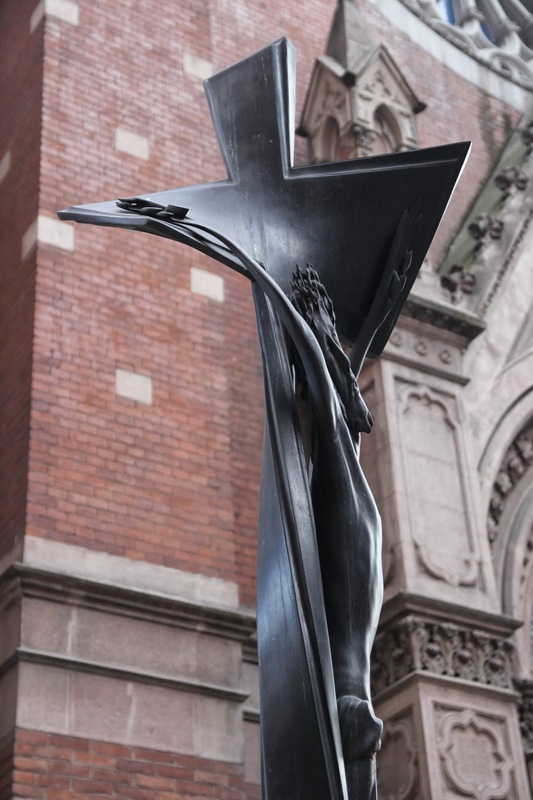 The interior was beautiful, still decorated for Christmas, and the exterior featured a uniquely abstract sculpture of Christ on the cross - a warped-looking piece that felt like looking at an optical illusion! 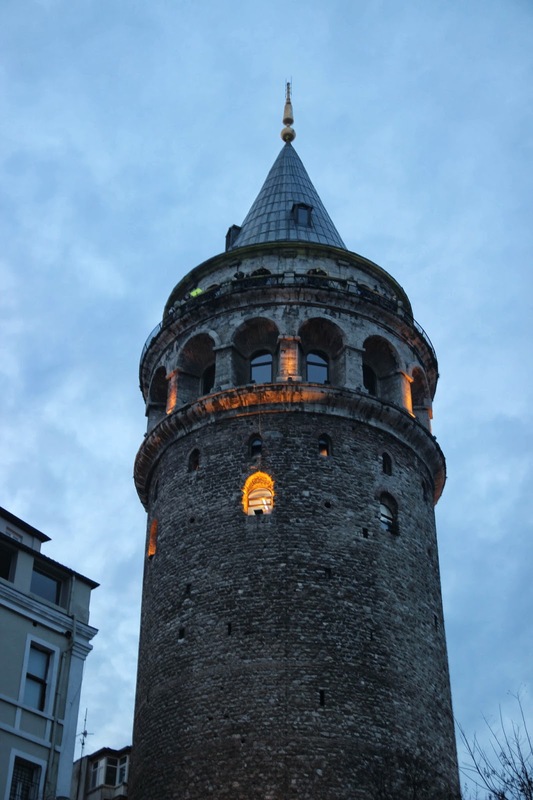 The final stop for me was the Galata Tower, originally built in 1348, used as an observation tower, a venture up to the top provides an incredible 360 degree view of Istanbul and the Bosphorus. I visited just before dusk, taking in the amazing sight of the numerous mosques dotting the opposite hill and the Bosphorus stretched out in front of me. As the lights in the city slowly came on the and light in the sky slowly dimmed, I returned to my hostel using the light rail so as not to return late for my next adventure, but I would return later to walk the Galata Bridge and take in the sights from that perspective. That evening, I had decided to join Ana, her mom, and her mother's friend for a trip to a traditional Turkish Bath arranged by our hostel. We were picked up from the hostel along with a few other visitors and taken to Gedikpaşa Bath, constructed in 1475. We entered and were taken to the women's side of the building, where we changed into bathing suits and towels. We were then escorted into a large, dark, humid room with a large flat stone in the middle and small rooms on each corner. We settled into the sauna, taking in the warmth and chatting until we were each retrieved by our masseuses, taken to the large flat stone in the main room, and told to lie down. From there we were drenched in water and scrubbed, which fell somewhere between being relaxing and being incredibly strange and uncomfortable!! Exfoliation was followed by suds and more water, then we were each escorted into the side rooms for a table massage using honey instead of oil. After the massage, we were again rinsed with water, this time also getting our hair shampooed and rinsed. Our remaining time in the bath was spent between the hot sauna and a pool of cool water, until we decided to rinse off, change, and return to the lobby to wait on our ride back. We sipped on hot tea until we were taken back to our hostel, where we freshened up a bit before returning to our favorite teahouse for dinner, tea, and hookah. While it wasn't a typical spa experience, it was certainly a unique one! The next day was unfortunately cold and rainy, so I took the advantage to visit Topkapi Palace that afternoon, spending a few hours slowly moving from room to room to view the exhibits throughout the complex. The palace was first constructed in the 15th century during the reign of the Ottoman Empire, and it covers a sprawling section of land overlooking the Bosphorus. The architecture was gorgeous, so it was a shame that no photos were allowed in one of the most beautiful rooms, as it housed holy relics of Islam. 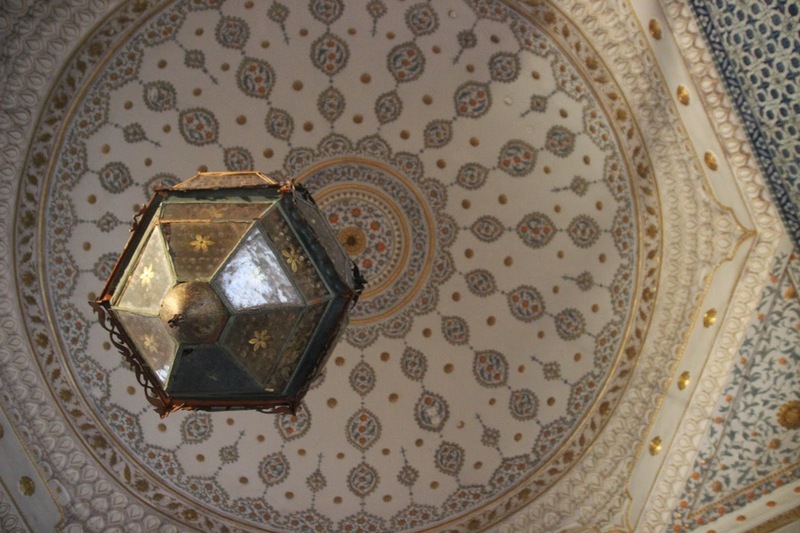 That room in particular reminded me of the Alahmbra in Spain, with beautifully ornate tiles covering the walls, stepped dome ceilings, and beautiful calligraphy on display all around. The collections of artifacts on display in the various rooms throughout the palace were also impressive - from clothing to jewels, thrones, treasures, gifts, and spoils of war. There was also a gallery entirely allocated to clocks, as well as a sprawling modern gallery full of weaponry. The cold, wet weather finally got to me, and I spent the rest of the evening resting at the hostel, having dinner, doing some work, and being generally entertained by the resident kitten, who had found and was subsequently chasing bits of tinsel from leftover New Year's decorations. 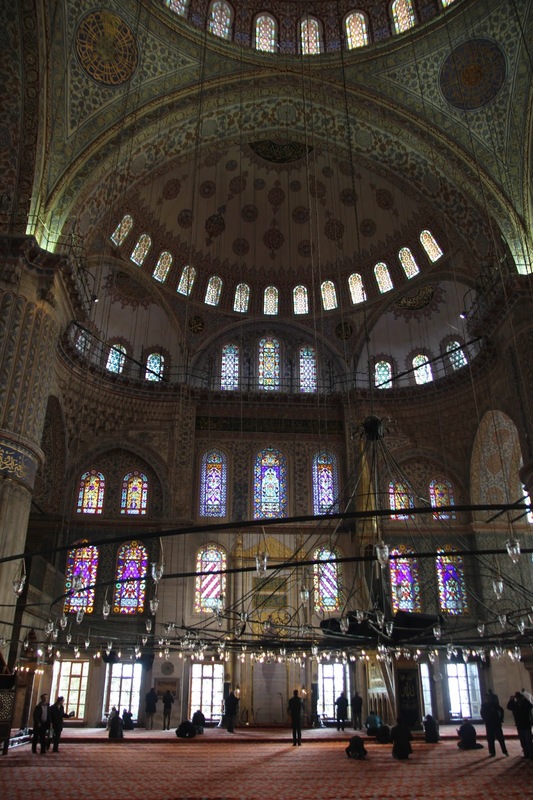 On my final day in Istanbul, I ventured out with a young Aussie who had just checked into the hostel to visit Süleymaiye Mosque that afternoon. 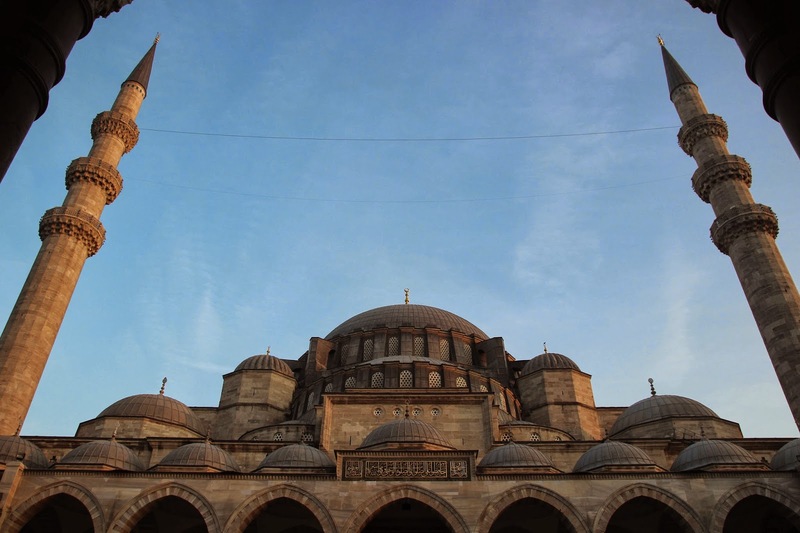 The largest in Istanbul (now that the Hagia Sophia is a museum rather than a mosque), the mosque is an enormous structure of smooth gray stone, its four minarets standing just to the side of the main structure, on each side of a large pavilion. Inside, the mosque was quiet, nearly empty, providing a perfectly peaceful environment in which to take in the grandeur of the interior. 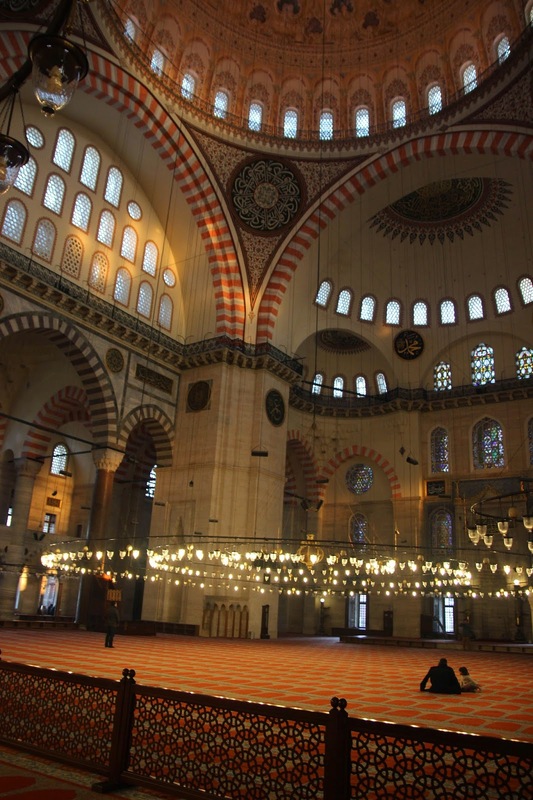 Of all the mosques I visited in Istanbul, the interior of Süleymaiye was definitely my favorite. Columns supported archways in stripes of white and pink stone, echoing the design of the mosque I had admired in Cordoba, Spain, many years ago. The dome radiated pink and gold, made of cuts of swirled marble that lended a natural, organic, abstract quality to the design. 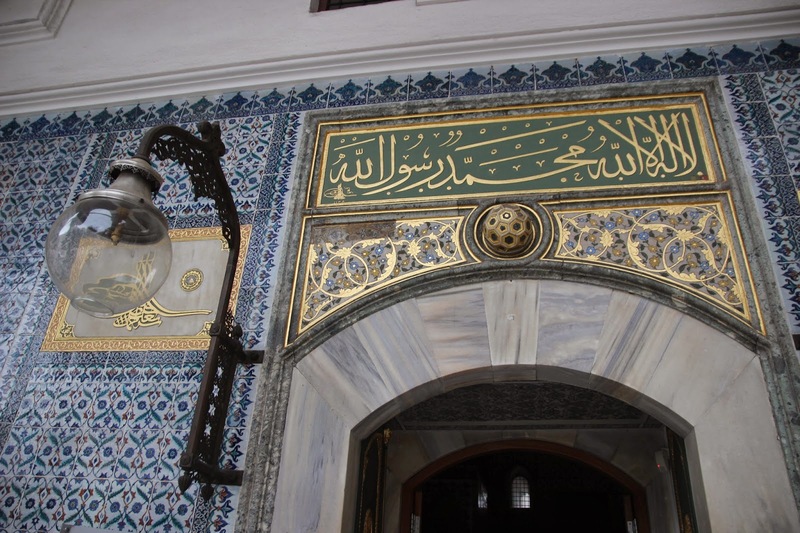 And of course the calligraphy everywhere was just stunning. I'm so glad I made the time to pay it a visit, especially on my final day. 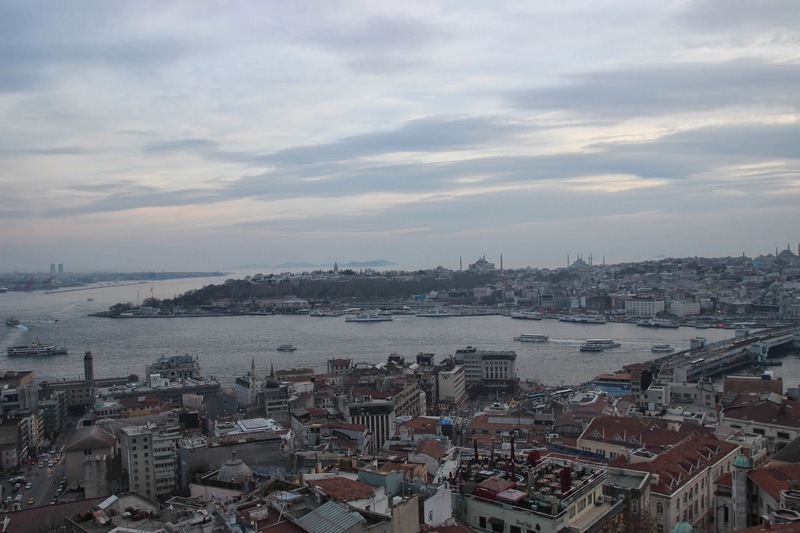 We exited just before sunset, and I split off to venture down to Galata Bridge, in search of a famous baklavah shop I had been told about. 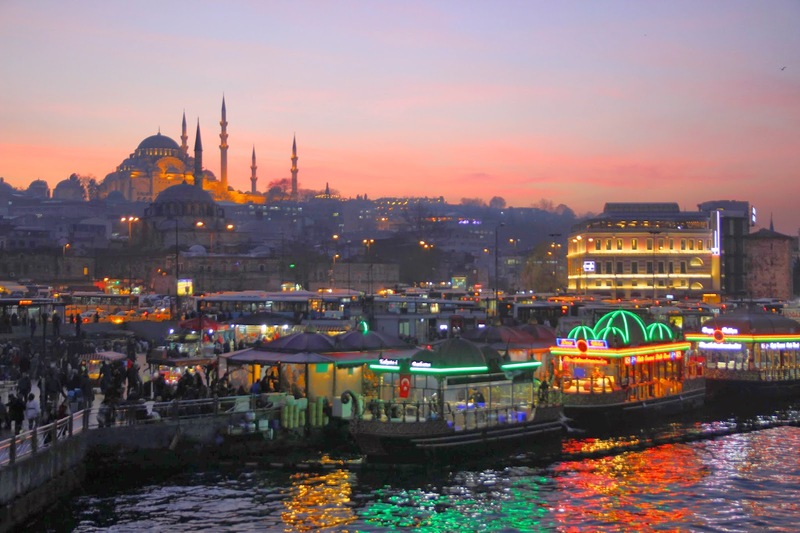 As it grew darker, the Süleymaiye and New Mosques were both lit up by spotlights, glowing against the pink sky. It was an absolutely gorgeous sight. Also an interesting sight, set up all along the sides of the bridge were local fishermen, some actively casting lines, some leisurely watching their poles as they leaned out against the sides. Once I arrived on the other side, I finally reached my destination - Karaköy Güllüoğlu, supposedly the site of the best baklavah in Istanbul, where I enjoyed a sampler platter (what I could finish at least!) and picked up a takeaway bag to share with the guys I would be staying with in Portugal the following evening. I returned to the hostel via the light rail, but again ventured out to the area just around the Galata Tower for one final evening meal before my departure the next morning. 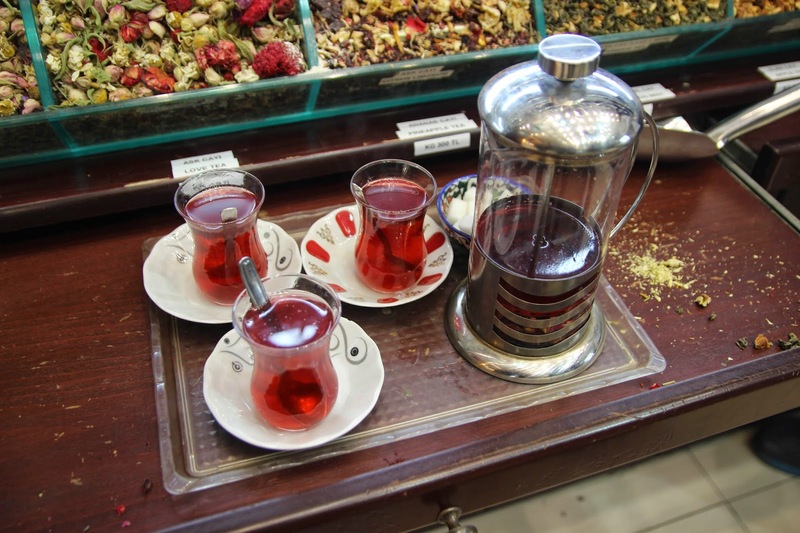 After chatting with the hostel owners and some friends for a few hours sipping tea, one of the guys, Muharem, who works as a tour guide in Istanbul, invited me to join him to sample some good local cuisine. We wound up at a restaurant called Kiva, where I not only had an incredible meal with a huge variety of typical Turkish selections, but I also learned quite a lot about the Turkish culture and history, while sharing bits of information about the States, especially Southern culture and music. By the end of our meal, our paper placemats were covered with crudely drawn maps of our home countries and various landmarks. 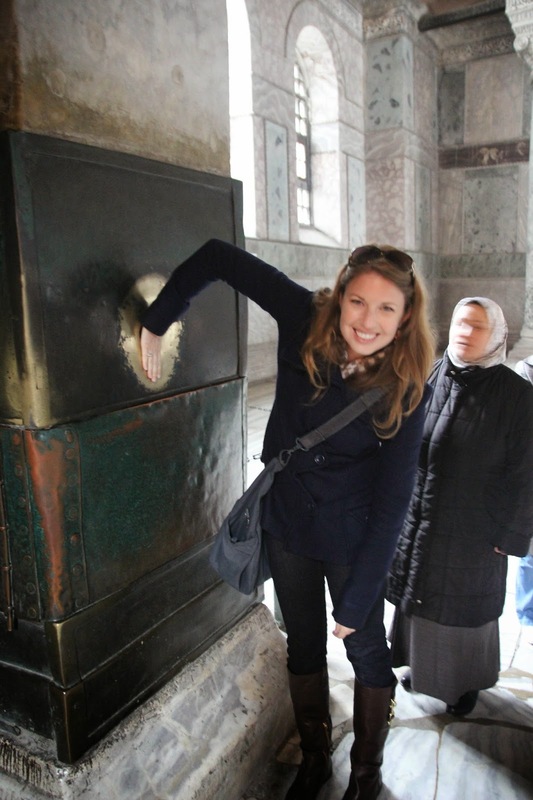 It's actually kind of astonishing to think of just how much significant history has taken place in and around Turkey. The oldest thing we had discussed about the States was the origin of the Blues and a brief explanation of the Trail of Tears, and here his hometown was the hometown of the Biblical Abraham and potentially one of the oldest civilizations in the world. 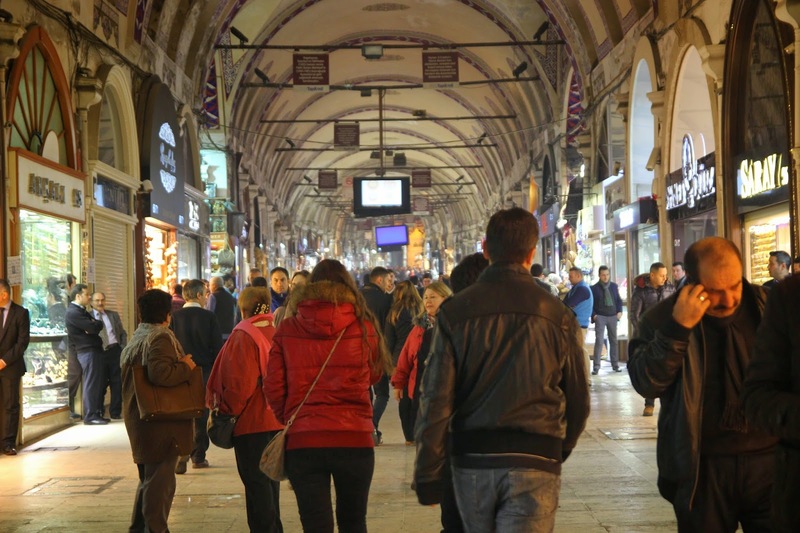 I'm still a bit amazed at how much I packed into a visit to Istanbul in a little less than a week and yet still had some time to relax and simply wander the city. A huge thank you to the guys at Nobel Hostel as well as Ahmet and Muharem for being such wonderful hosts, sharing information (and food!) and welcoming me in your country. If I could have spent longer, I would have loved to visit Cappadocia and some of the other regions, but Portugal and the next stage of my adventure awaited. Perhaps someday I'll have the chance to return!